Sprayed concrete; either as gunite or shotcrete, is one of the most popular choices for a top-end, luxury pool. What are the advantages that this method of pool construction has? When you are looking to have a top end, swimming pool designed and built there are a number of factors that you will want to take into consideration. When investing a considerable amount of money in a new pool you will want to be assured that your pool is built to last. The pool should be strong and durable. The pool should have a good thermal mass – that is the shell of the pool itself will absorb heat and retain it in such a way that heating costs and therefore the carbon footprint of the pool is minimised. The chosen construction method shouldn’t impose any restrictions on the design or location of the pool and that method should be one that can conform to a deadline and construction schedule. Sprayed concrete has become the number one choice when it comes to luxury pool construction because it conforms to these important criteria. The premier pool construction method. Sprayed concrete is known as either gunite or shotcrete. The most important thing about either material is that it is blown by compressed air into the structure at a high pressure. This means that the building method is potentially much quicker than pouring concrete into a shuttered form and – as the force used in the process compresses it – it should be stronger. The difference between the two materials is that shotcrete arrives on site in a dry form and water is applied at the spraying nozel where as gunite arrives as a wet mix. In either case the concrete is sprayed into a rough former around the sides and on to an aggregate floor. Steel reinforcing bars tie the whole structure together and are covered by the sprayed concrete. The gunite or shotcrete is finished by hand, working it up into precise shape and a smooth surface. This method of construction means that pools of almost any shape can be designed and built and the method is suited to potentially inaccessible sites such as underground poolrooms or tight urban areas. Any pool construction is a challenging task that should be carried out by skilled professionals but with top-end pool builds the quality and accuracy demanded is of course even higher. These specifications need to be transferred exactly to the finished project and 3D laser positioning is the most acceptable way of achieving this. Of course, the top-end client wants to see the design that they have bought accurately realised but if one considers that a moving floor pool must be accurate to within a few millimetres of the design specifications in order to function correctly then you can see that there are also real, practical requirements for excellence and accuracy of construction. Sprayed concrete pools have no joints to worry about; they can be built to almost any shape or design. 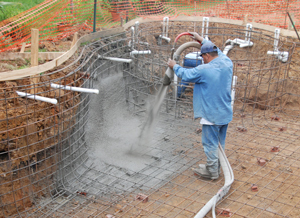 A gunite or shotcrete pool can be built where access issues would trouble other methods and they can be built quickly. For a large, top end pool, it is the construction method of choice. A luxury pool deserves top-end equipment. When you are having a pool designed and built to the highest standards, it only makes sense to make sure that the fittings do justice to the project. Stainless steel skimmers and inlets give a wonderful finishing touch to the completed pool. Stainless steel pool fittings designed and manufactured by Pahlen of Sweden will not only give a classic and elegant finish to your pool but will keep on looking good for years and years to come. The one thing that probably makes the biggest difference to the final look of your pool – at least after dark – is lighting. LED lighting is the norm for most new builds these days but not all LED lighting is created equal. Of course, a swimming pool is all about the water and one of the best ways of getting the ultimate bather experience is to use UV water treatment. Leading water treatment specialist Triogen, offer a range of units suitable for domestic or commercial pools. The main benefit of switching to UV disinfection is improved water quality as the TR2 unit controls algae, chlorine-resistant organisms and other unwanted life forms, without having any harmful residual effect or leaving any by-product in the water. We can help you find your nearest pool construction company who works with sprayed concrete and to get that process started just use the find a supplier link at the top right of this article.